Concerned about the zombie apocalypse? A handy-dandy new website, mapofthedead.com, uses Google maps to display information useful to help you survive the eventual zombie apocalypse. It tracks danger zones with high concentrations of people, and the location of useful places where to find food, fuel, guns, and of places to avoid such as hospitals or cemeteries. And why don’t try the related free iphone game app Map of the Dead available on itunes? Are you addicted to the Robert Kirkman’s zombie comic book or TV-series The Walking Dead? If so, you will enjoy the complete annotated map of appearances, deaths, events and locations. The Walking Dead Google map, created by Jason McDonald, uses symbols to indicate different events, such as Zombie Skulls to indicate attacks by undead, White Skulls to mark murders perpetrated by the living, Knife & Fork to show where Cannibalism took place etc. The information comes from all 78 issues of the comic series, so you are warned: it contains spoilers! Are you living in Seattle? Are you worried about the zombie apocalypse? 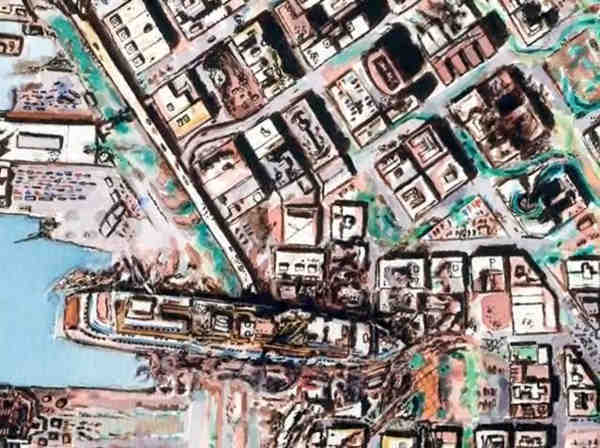 Get a doomsday map of Seattle! The map has been created by Tony Dowler, a local artist, and spread after a successful Kickstarter’s project, which raised $18,386, where Tony asked for $1,500 to print copies of his map. 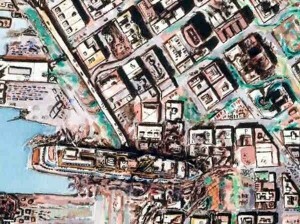 The huge map, watercolored and enriched with ink and pen, is based on an image taken from Google Maps, and shows the effects of a zombie aftermath in downtown Seattle. Watch parts of the Seattle doomsday map at Tony’s Flickr page. It took Tony an hour a day for a year to paint the doomsday map, but the results are great, and so is the attention to the details: the map is extremely detailed, and includes roads, buildings, habitable and zombie-infested areas, collapsed buildings, neighborhoods devastated by fire, water and returning nature, ruins, vegetation, structures, and even skyscraper shadows, survivor hideouts, car crashes and abandoned cars on the highway. The map comes to the Kickstarter funders with a fictional survival guide, “Dee Dee’s Doomsday Guide to Surviving in Post-Apocalyptic Seattle“, revealing all the secrets to surviving in post-apocalyptic Seattle, and a foldable version of the map. This zombies map has been created by the Oxford Internet Institute, a department of the University of Oxford for the multidisciplinary study of the Internet, which produces engaging maps and graphs. The researchers have used online data from Google’s searches and other content stored around the globe, to represent graphically the number of references in internet to the term “zombies”. The map is basically a kind of demo of the activities of the Institute showing how huge data could be analyzed, geolocalized and visualized on a map, and has obvious limits: what the map shows is that searching for “zombies” is prevalent where there are a lot of people speaking English, and U.S., Europe, Japan and a few cities in Australia indeed come up as the biggest-areas of zombie-interest. Previous PostH+ The Digital Series: Ethical Dilemmas On Transhumanism And Future TechonologiesNext PostIs An Underground Shelter The Best Place To Survive The Apocalypse?